RAGAMALA -- A Garland of Ragas at the TATA Theatre (NCPA) in December! After the grand success of DES in September 2017, we are happy to announce that our show, Ragamala is taking place on December 15th at the TATA Theatre (NCPA) sponsored by Godrej Industries Limited, The Wockhardt Foundation & Arihant Trip Solutions LLP! 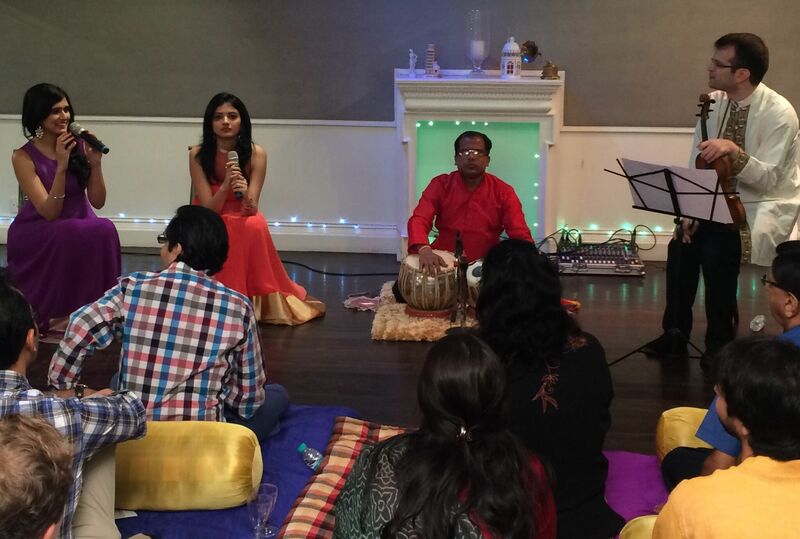 Our vision to demystify Indian classical music and make it approachable and understandable to crowds all over Mumbai through our Indian Music and Dance Programs. The show comprises of a culmination of all the programs we work with in collaboration with Indian dance with Chhandam Nritya Bharati headed by Seema Mehta promoting the theme of “Ragamala Paintings”. Our concert will feature more than 150 performers including children from an array of various institutions spanning all over Mumbai. 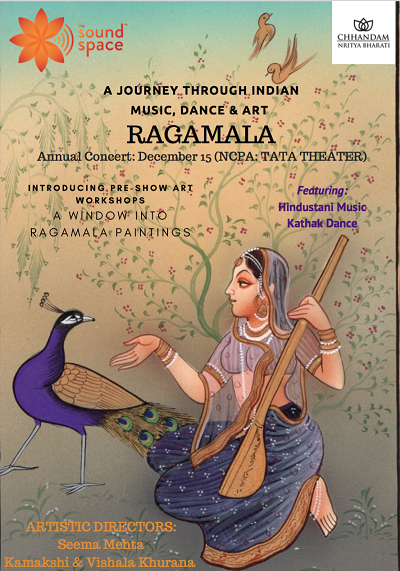 The aim of this journey is to help everybody experience the beauty of Ragamala paintings interpreted through various performance art expressions such as music and dance. Book tickets on BookMyShow now. Participants will include our students from all our music programs from international schools to outreach programs. Please join us and be a part of this holistic event. Shadaja by The Sound Space is a revolutionary music curriculum for children where they are introduced to traditional Indian music through intensive classes over a period of time. Shadaja classes are based on a module that we have crafted after years of research in Indian music, educational trends, comprehensive studies on children's developmental patterns and more. Through Shadaja, we educate children about the rich folk music of our country, we introduce classical Indian music to them, we make them interact with various musical instruments and local artists. Beyond this, we work in smaller groups with children for dramatics, story-telling through songs, pattern & rhythm recognition for better mathematical skills, vocabulary development through songs, breathing and concentration exercises, better social and emotional IQ as they engage with other children. We also conduct special parent-toddler classes to introduce the little ones to music at a very young age for its benefits are life long. It's an intensive 20- and 22-week program for children across various age groups to learn and enjoy music like never before! Discover The Playback Singer Within You! The Sound Space is pleased to announce its intensive three-day summer workshop for children to introduce them to music in an exciting avatar. The workshop is aimed to initiate the participating children into the world of reel-to-real music through in-depth understand of creating music in a studio. The workshop will allow children to work hand-in-hand with renowned music artists, understanding ragas, sur, rhythm, the intricacies of singing in the fertile environment of a studio, listening to their own notes on a mic, dubbing sounds and also programming the song on a console. Through this workshop, the children will see their fruits of labor come to life as they will take away with them their very first song produced and recorded by them. This for children in the age group 5 - 9 years. Day 3 - record your song in a studio! Music Coding Workshop With TSS & Sonic Pi. This summer, explore the fascinating world of music coding with The Sound Space on a platform called Sonic Pi, a software developed by Dr. Sam Adam of the prestigious University of Cambridge. It's the first of its kind in India and children will learn Ruby on Rails on Sonic Pi. Children will be able to identify what a synthesizer is and produce different sounds to compose a musical piece. This workshop is for children in the age group 9 - 14 years and will be held at Studio Balance, Chowpatty, Mumbai. Our third edition of Shadaja transformed itself into two-day music festival, a first of its kind for Mumbai. The music festival also witnessed legends Shubha Mudgal and Aneesh Pradhan perform for the enraptured audience. Giving our little mentees a platform to showcase all that they imbibe in The Sound Space's three-month long intensive Indian music training, Shadaja 2013 was the beginning our 'edutainment' journey. A one-of-a-kind music experience for the connoisseurs of Indian and western music with soulful renditions of ragas and raga-based film songs sung by Kamakshi & Vishala Khurana. On the saxophone was renowned saxophonist Rhys Sebastian who weaved his magic into Indian music vocals.